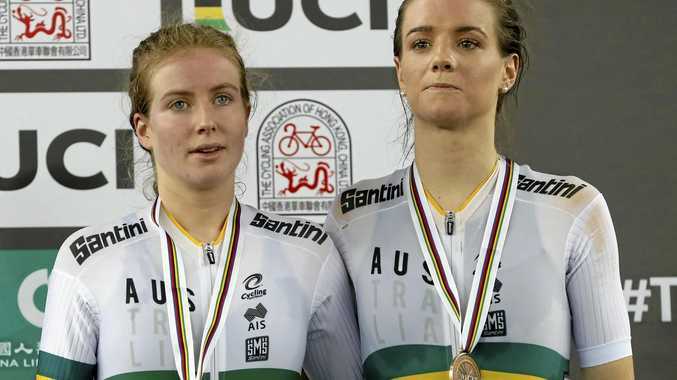 CYCLING: Australia has had an outstanding track cycling world championships in Hong Kong, easily topping the medal count. Australia finished with 11 medals - three gold, five silver and three bronze - six more than second-placed Russia with five. Tasmania's Amy Cure, 24, became the first person to win a medal in six different world track events by reaching the podium three times in Hong Kong. She is has the second-most world title medals for an Australian female cyclist behind Anna Meares (27 medals). Cure (pictured)claimed silver in the team pursuit and bronze in the madison and omnium events. Her collection of medals have come in the omnium, madison, points and scratch races, and the team and individual pursuits. In Hong Kong, the Australian women won six medals, while the men's had five medals including both pursuit crowns and the points race title.